Mission: To enhance the worldwide image of New York City and enrich the New York experience by connecting visitors with knowledgeable and enthusiastic volunteers. 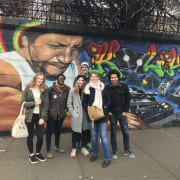 Activities: These volunteer greeters take visitors through neighborhoods of The Bronx that they know well. Visitors are able to experience the ethnic sights and sounds with the greeter and can get a real taste of The Bronx and its inhabitants. Visits may include from one to six people. Qualifications: Greetersmust enjoy meeting and talking with people from diverse cultures and backgrounds. They must be familiar with and upbeat about the neighborhoods that they want to show. Foreign language skills are a plus, especially ASL and Spanish. It is essential that volunteers be comfortable using public transportation, since it is the easiest way to get around New York City and we feel it helps make each visit to New York City even more like a slice of the daily life of a New Yorker. Time Commitment: Greeters show neighborhoods 7 days a week, 365 days a year. Eachgreeter must commit to a minimum of one visit per month, usually about 4 hours per visit. Benefits: There is a thrill in makingnew friends from all over the world. Asa greeter you will be able to show off those neighborhoods you know and love. If you speak a foreign language, here is your chance to practice it with native speakers. You will be able to promote a friendly, inviting and accessible image of New York City. Minimum of one four-hour visit per month.